This might come off as a bit odd, but I’ll say it anyway. I’m starting to lose interest in games that tout expansive game maps. It’s not that I hate the idea of having a huge playground to frolic around in, running over or fus-ro-dahing everything in my path. The real problem is that deep down these games have one common problem. They don’t focus on the little things anymore. Let me explain. Back in the day games didn’t have as much graphical horsepower as they do now. If you wanted to make your game stand out or even look presentable, you had to know how to work around those limitations while still providing an immersive experience. A game had to have character. 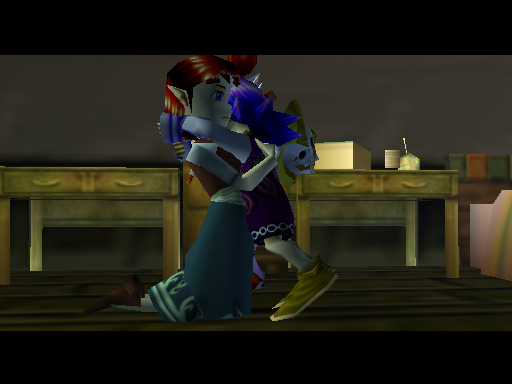 I’ve been playing some Majora’s Mask and I’ve noticed a few things it has improved upon since Ocarina of Time. The game just oozes so much more character in comparison to its predecessor. Almost every character has their own identity. They are unique and don’t feel like stock civilians like you see in more modern sandbox games. Let me ask you a question? When you go on a rampage in Grand Theft Auto, do you ever wonder about the people you’re murdering? Do you question who that person is or what their motives were in life? Of course you don’t. I mean why would you? These pedestrians are simply there to fill a world and make it feel less lonely. They don’t have an identity. I’m not saying that ginormous sandbox games are the bane of our existence, but something about a more linear experience just seems more compelling at times. I’d rather run around a village with a slew of interesting characters than run around a continent of lifeless drones.